If gym workouts or organised sports fill you with dread, why not consider a form of exercise that is simple, free and has proven health benefits? Walking has been shown to help reduce stress and anxiety, whilst improving sleep and overall wellbeing. In fact, according to Dr Nick Baylis, FRSA, consultant psychologist at Cambridge University, walking can benefit our lives in ways we might not have considered. Here, Dr Baylis has teamed up with HF Holidays to explain why we should all get walking this autumn. Walking can help improve your memory and brain function. When you walk, your heart rate increases, pumping more oxygen to the brain. This then releases hormones that nourish the growth of brain cells and facilitates information processing. “The restorative effects of walking outward-bound come from the accumulated benefits of nature in the open-air, the purposeful nature of exercise, and the companionship in a shared challenge,” says Dr Baylis. Dr Baylis believes that we should be moving away from our digital and mobile phone dependency, and this can be accomplished through practising mindfulness when we go for a walk. If you are someone who struggles with keeping to a fitness routine, walking can help you overcome this. 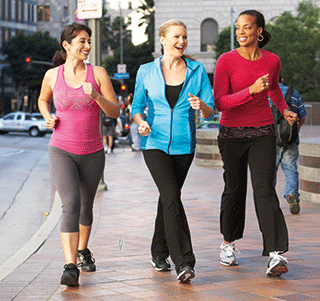 In fact, experts believe that walking has the highest compliance rate of any exercise plan. People who begin a walking routine tend to stick with it as they can start seeing the results of their efforts fairly quickly. Being able to stick to a routine like this will boost your confidence and help you focus on setting and achieving bigger goals in the future. “If you are a novice walker, it’s best to start with a shorter and easier walk that allows you to soak up the scenic paths at your own pace,” says Dr Baylis. “You should also try and stay fully hydrated, and ensure that you are dressed right for the walk. Wearing the right shoes, clothes and accessories go a long way in not only making you feel comfortable but also keeping you safe during your walking adventure. Walking can literally be a life saver – in both the physical and emotional sense. According to the NHS report, Walking Works, if everyone in England were sufficiently active, nearly 37,000 deaths a year could be prevented. Furthermore, the British Heart Foundation states that brisk walking can help to keep your heart strong by strengthening your cardiovascular fitness and reducing your risk of developing heart disease and high blood pressure in the long-term.